All of the makeup and skincare on Farleyco.ca makes me happy. They have all the "giftables" you need to fill stockings or combine as one fabulous beauty set. Most can be found at Rexall drugstores. The below are some of my absolute favs. Flexitol Lip Balm - a truly repairing, moisturizing balm that has a fresh minty feel. You need to try it - only $5! EcoTools Ultimate Shade Duo - EcoTools brushes have been my favourite brushes since 2010. (See all my reviews here.) This duo is perfect for applying shadow to my lid, and pinpoint concealing spots. I also love using the smaller brush to smudge eyeliner out, define my outer eyelid corner, and apply shadow to my lower lid. You need to pick these up since they're only $9 for the pair. Real Techniques 4 Miracle Mini Complexion Sponges - this is a big moment. 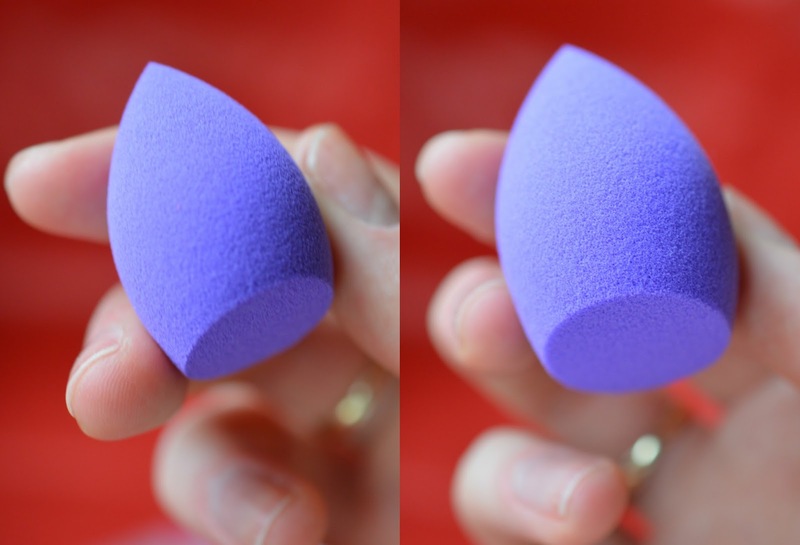 I've wanted to try these little Beauty Blender-style sponges for so long, and now I finally have them! Let me tell you, these tiny sponges don't disappoint. When you wet them, they nearly double in size and they apply concealer flawlessly. I keep one in my desk at work in case I need a concealer touch-up. They'll run you $16 and can be split up into 4 stockings. 7th Heaven Masks by Montagne Jeunesse - at $2 each, these one-time use masks are a great add-on to any beauty lover's gift. Their clay masks and peel-off masks are always fun and effective at clearing out your pores and refreshing your skin. I get lots of dry patches so I can count on these masks to reduce the flakiness around my nose and chin. Isn't this the cutest idea for girlfriends? 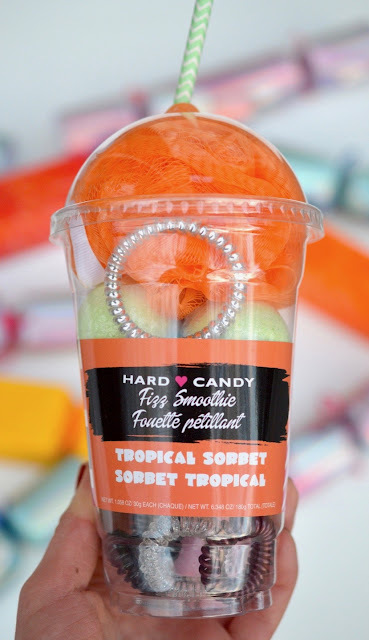 Hard Candy makes these cute cups ($5 at Walmart) filled with bath bombs and a loofah. I jazzed it up by adding some of my beloved Hair Slinkys. These non-tugging hair elastics look great and feel even better in any length of hair. They also coil back to their original size if you drop them into boiling water. Another brand I've started to test is GummiBand. They have a similar array of colours and one size of hair tie. GummiBand works in partnership with Kiva providing loans to women who own small businesses around the world. 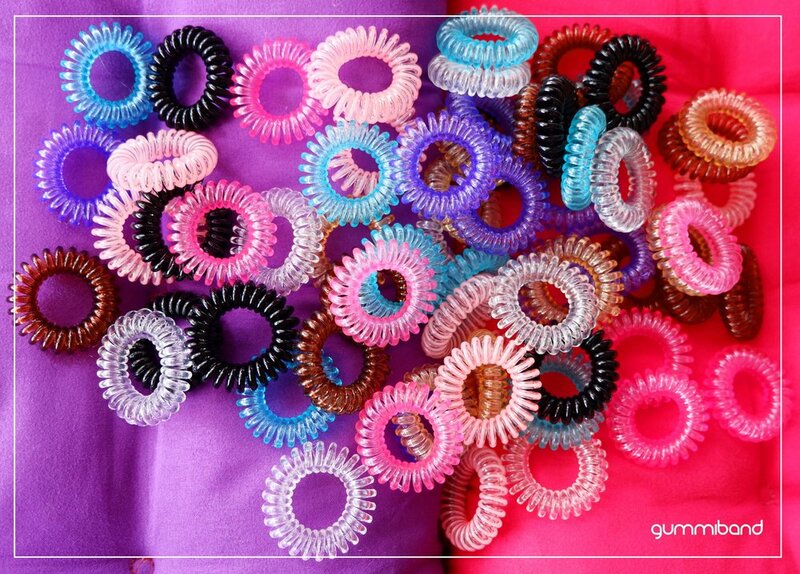 Shop GummiBand here. L'Occitane is nothing new to my blog, so I'm thrilled that they have so many affordable gift ideas for the holidays. My favourite from them are these Christmas Crackers filled with 3 deluxe sample sized products: body wash, body lotion, hand cream and/or a bath fizzer. Online, you'll receive 3-9 crackers for free with purchase, or you can head into stores to try and find the set of 3 for $34. It's already sold out online! Hard Candy also has a Holiday Crackers Collection for only $15 online at Walmart.ca. The 6 crackers each include a full-sized beauty product. 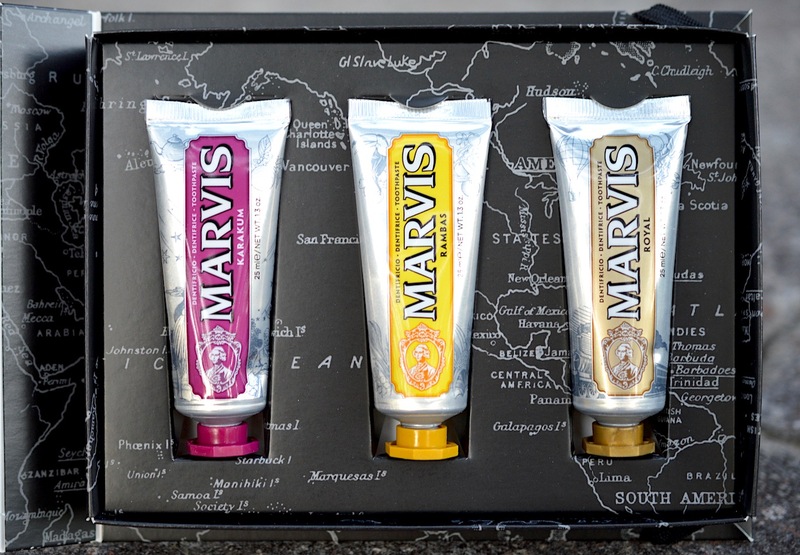 Marvis toothpaste is the epitome of classy wash bag essentials, and this Italian gem works great too. At around $25 cad for the limited edition Wonders of the World Travel Set, you can't go wrong. The flavours are inspired by adventures around the globe: Karakum - fine peppermint with sweet orange and cardamom, Royal - Italian lemon, tangerine, rose and mint, Rambas - ripe peach, sweet pineapple, mint and mango. Last year's Marvis review is linked here. I bought this $24 lip treatment in the summer after receiving a Sephora GC for my birthday. I'll admit that it didn't reach HG status until recently, since I still love my Paula's Choice Lip & Body Balm. The Sleeping Mask from Laneige is truly unique, sinking deep into the lips overnight leaving you with a plump, repaired, supple pout in the morning. It doesn't just sit on the skin like other waxy balms. The teeny spatula is luxe and smooth when applying the thin product. It's yummy strawberry fragrance is light and tasty. On the Laneige website this product seems to come in 4 flavours. You can also get it at Sephora here. Card games! What an unheard of present in this digital world. Whether I'm at the cottage or in a foreign country, I always carry card games with me for group entertainment. These two are especially great for kids, parents or teachers. Totem, dubbed "The Feel Good Game" is $25 online and can be purchased in French or English (it's Canadian!). Each group member will give and receive animal "totems" and qualities that correspond to them as a person. There is no winning or losing in the game, but there is definitely a lot of laughs and smiles when you're named a supportive platypus or strong ant. Spot it is $18 and can be found at Walmart, Chapters, Well.ca. I think this is my favourite game of all time, and I loved it so much that I gifted it to a teacher friend when studying in Cuba last year. 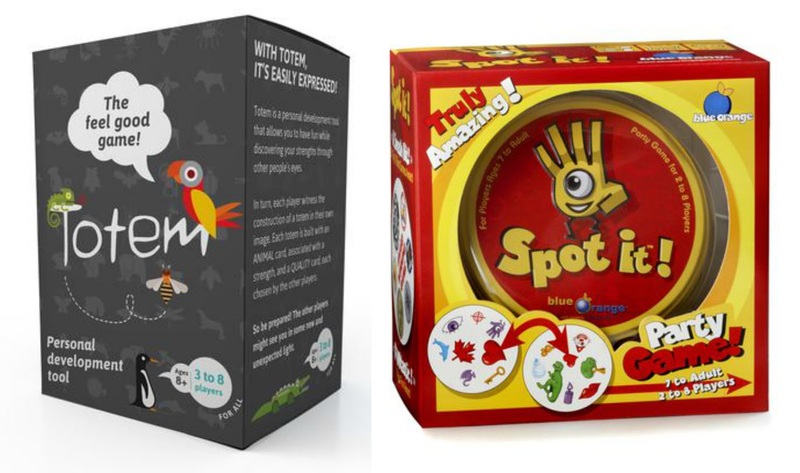 Anyone of any age can get deeply concentrated into playing Spot It and have a ton of fun. There are many ways to play and keep it interesting, you could even turn it into a drinking game. 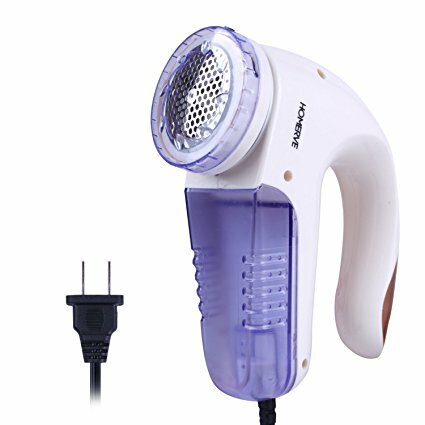 A gadget to change your life: the sweater shaver. Everyone needs one of these in their house to keep clothing looking fresh. Whether it's your pea coat getting pilly or a sweater looking too fuzzy, plug this machine in and gently move it over your fabric to watch it remove the pilled up fibres. I got mine at Walmart but this one is only $24 on Amazon.ca. This desktop essential will keep your coffee and tea warm for hours. Joseph got me one for my birthday two years ago and it took me a while to start using it religiously. Now, every morning my cup warmer is turned on to keep both paper and porcelain cups from turning ice cold. 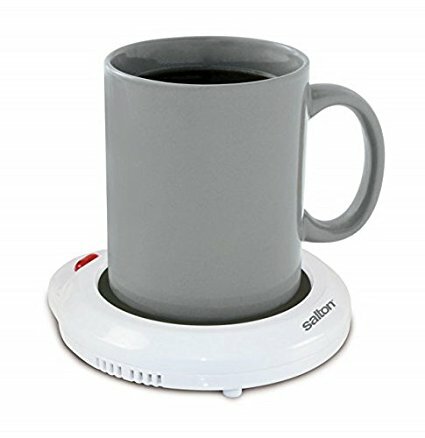 A mug warmer will run anywhere from $10 - $20 on Amazon.ca. 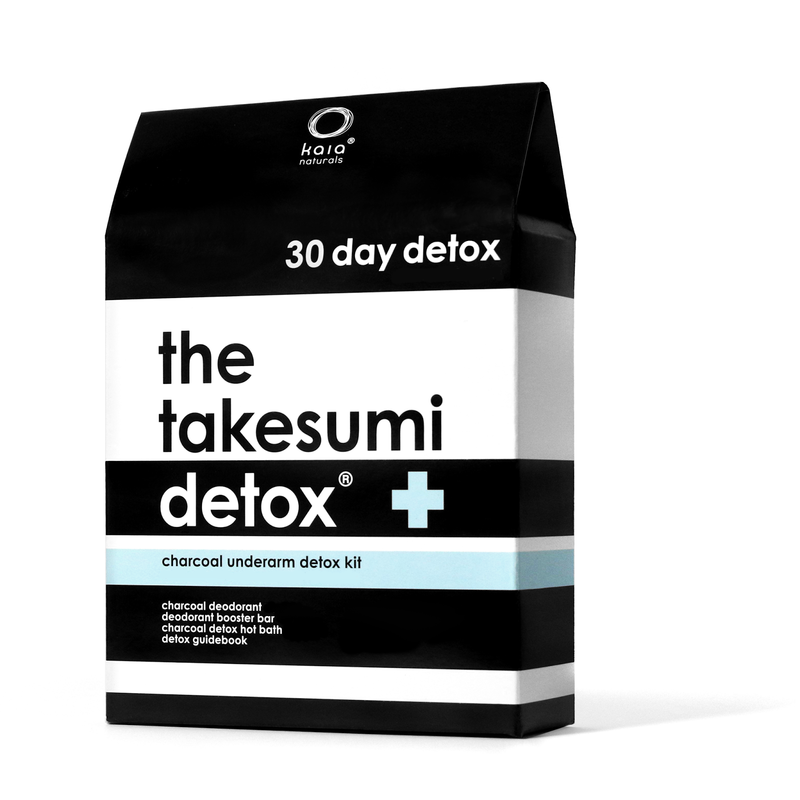 Located in Toronto, Kaia Naturals has created a detox kit that low key changed my life. I am in love with the sweet spearmint scent of the black soap, which comes strung on a convenient rope and looks very cool in your shower. The deodorant, in a fresh rose scent, feels a bit like antiperspirant but works amazing as deodorant. After epilating my underarms, I don't like using a standard antiperspirant since my pores can get irritated and dry. This deodorant stick is cooling and fresh, it is a pretty grey colour and feels soothing on my skin. I may feel slightly wet throughout the day if I'm exercising or nervous, but I'm never noticeably smelly. The bath soak is now a holy grail product as well. Even just a tiny amount of the salts will create a relaxing, fresh ambiance of warm sweet mint to detoxify and soothe sore muscles leaving you ready for bed. Any of their products are guaranteed to be great, but my favourite is the charcoal underarm detox kit for $42. Shop Kaia Naturals online here or at the Detox Market in Toronto.